Smartphone and tablet users rejoice! The newest update to the boberdoo.com lead distribution system makes viewing and using your system from smaller screens easier than ever before. In the past, certain pages such as the Leads tab or Partners tab were completely compatible with any desktop or laptop screen size, but it was more difficult to use from the smaller screens of tablets or smartphones. With the latest update to the boberdoo system, we have addressed this issue, allowing you to easily access, view and take action from even the longest and most detailed sections of the system. To do this, we have created the column priority configuration tool. This page will take you through the simple steps of setting your column priorities. You now have the ability to customize your Leads, Partner, or any other column-based tab to show you the information you want to see and in the order of your choosing. For this example, we will take a look at the Leads tab. 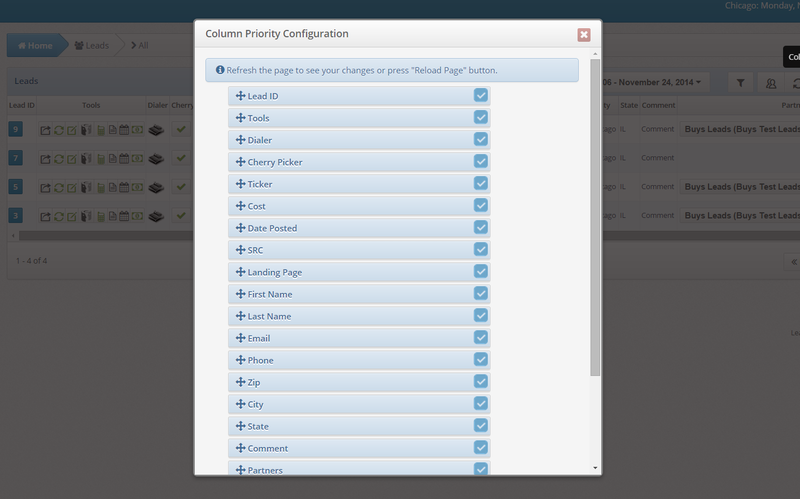 To configure your column priorities, access your Leads tab and select a lead type. Next, you will see a new button at the top right corner of the page. If you mouse over this gear-shaped icon, you will see that it is titled Column Priority Configuration. After clicking this button, you can simply drag and drop your fields to display their corresponding columns in the order of your choosing. You can also choose to hide fields as well by unchecking the box next to the column title. Any columns that you order at the bottom of the page can still be accessed by scrolling to the right once you save your settings. The columns available to you and their titles are specific to your system and your lead types and can be customized to your liking through a support ticket. If you still need assistance with configuring the column priorities on any of your pages, feel free to contact us.